If you can only purchase one book, for teachers and administrators, make it this one! Free and priceless - everyone should have and read! Raising a gifted child is both a joy and a challenge... guides parents through all the phases and possibilities of the gifted child, including underachievement, sensitivities, twice exceptionalities, friendships, siblings, schools, identification, and much more! Exceptionally or profoundly gifted children? Read this book! Grade acceleration: should we, or shouldn't we? All young people need a safe, supportive place to “just talk” with caring peers and an attentive adult. Talk with Teens has been tested with thousands of teens in many kinds of schools, community centers, churches, and workshops. Its guided discussions are proven ways to reach out to young people and address their social and emotional needs. Teens gain self-awareness and self-esteem, practice problem-solving and goal-setting, feel more in control of their lives, and learn that they have much in common with one another—they are not alone. Elementary and middle school math enrichment, extraordinaire! Language arts is key, here's the key to excellent L.A. instruction! Every parent and teacher of readers should have this book... that's all of us! 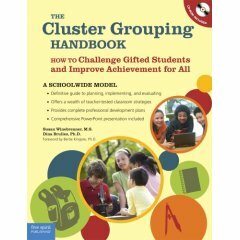 Parents and gifted adolescents, these are must-read! For those families who are (or will ever consider) homeschooling their gifted children... and teachers will gain a great deal from this book, too! This terrific book is for homeschooling parents and more - there is information for schooling parents, school teachers, gifted teachers, and more, on gifted children, learning styles, internet resources, and so much more! A humorous look inside the home of 5 very gifted children... from the mom's point of view. Prepare to have your funny bone thoroughly tickled! Thorough introduction to twice exceptional gifted children, plus extra on Asperger's and more... Parents should have at least one of these; schools should have all three!